My absolutely favorite beach activity is searching the sand for shark teeth. It’s relaxing, challenging, and dare I say it? Therapeutic! One of those mindless activities that allows you to completely zone out. Ahh! It’s the same reason I enjoy pulling weeds in our yard. But that’s another story, and you’re thinking I’m really weird now, so let’s stick to the subject at hand – How to Find Shark Teeth! Okay. Let’s get to it! When to Look: One of the questions people always ask is, “What beach has the most teeth?” But the most important question isn’t really where to go but when to go. I’ve found that the best time to look for shark teeth is just before low tide. You can find the tide info for your area online, or even download an app to make it easier. I use Tides Near Me on my phone. I like it, because I can look up tides at specific beaches to help me decide when to go looking. The absolute best time is an hour or so before low tide. I look for groupings of shells and stand in the water so that it’s just over my feet. The water moves the sand and shells around making it easier to spot shark teeth. I also find a lot of crabs and other sea creatures while doing this! Where to Look: Okay, so where also matters. Other than the edge of the water line as I mentioned above, keep your eyes open for large groupings of shells. You’ll often notice them along tide lines, areas where the tide previously came up onto the sand and left sloppy lines of shells on the beach. I also find them along the edges of run-outs. I think run-out is redneck slang for tide pool. 🙂 The shells and teeth often end up along the edges of the pools, so just walking around them brings success. Another spot that always delivers is right up along the dunes. (Just be careful not to get too far up on the dunes, or you might get a ticket for disturbing the wildlife!) The other day I went to the beach with my Mom and a girlfriend to look for teeth. It was high tide, so we didn’t have much luck until we started looking up along the dunes. All we did was run our hands along the top of the sand and there they were! If you’re local, Mickler’s Landing is the best place for this, because there are so many shells packed into the dunes. I’ve also noticed that the larger teeth are higher up on the beach. I have no idea why – there is surely a scientific explanation, but I don’t know it! 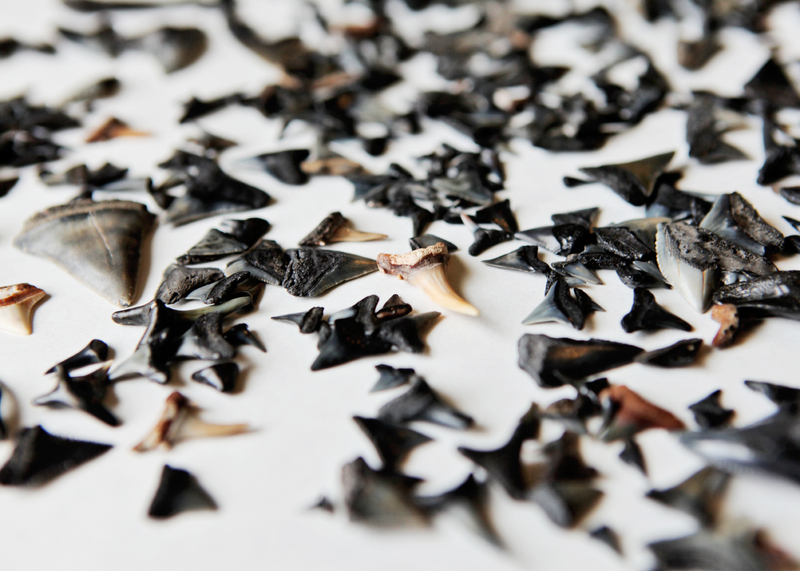 What to Look For: Shark teeth vary in appearance but are almost always triangles and are usually black. I’ve also found quite a few grey ones, some brownish red and even a few white (you can see the variety of colors is the picture of my collection above) but most of them are black. They also shine differently than the shells on the beach. So if it’s a bright, sunny day the shine gives them away! This may sound a little crazy, but I think you have to train your eyes/brain to spot shark teeth. At first it feels like work, because you’re really thinking hard about what you’re supposed to look for. But once you find a few, you’ll start feeling like they are jumping out at you! – This hobby is not for the self-conscious, because you can’t worry about how you look while you’re doing it! You’ll be crouched/hunched over a lot to get a closer look at the shells. It won’t be pretty, but just go for it! 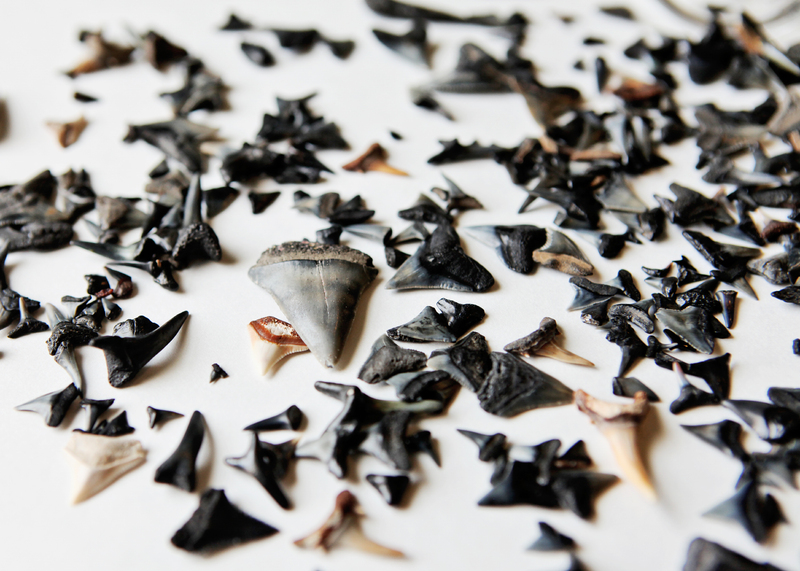 – Sometimes you’ll see a shark tooth in the water, but the current will take it back out before you can grab it. UGH! That’s the worst! You really have to bend over and grab them FAST when you’re looking along the water line. – I sometimes find teeth when I’m not really looking – while digging holes in the sand with Kingston or walking back to our towels from the water. So always be looking, even when you’re not looking. ha! – Some days you just won’t have much luck. But it helps if you branch out and collect sea glass and/or unique shells too – that way you won’t go home completely empty-handed! – Know that once you find your first tooth, you’ll be hooked! 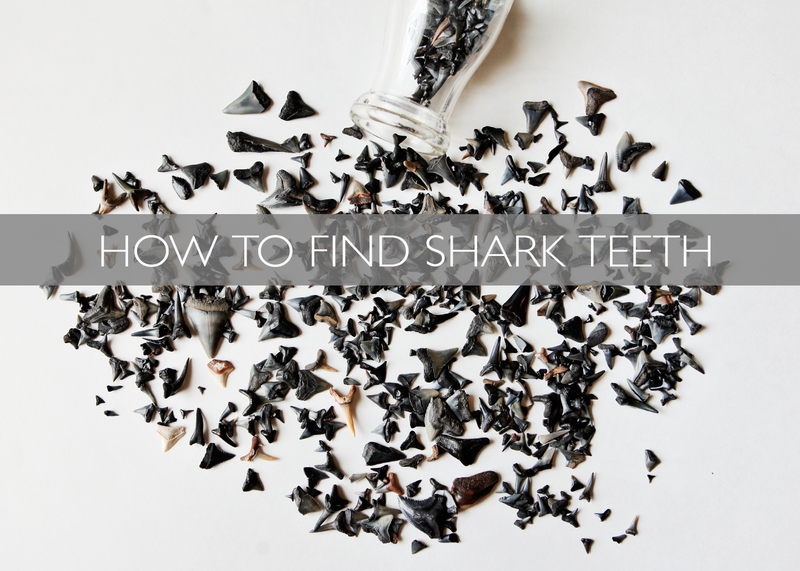 Do you have any helpful “how to find shark teeth” tips to share? Feel free to leave them in the comments if you do!